Foto: Lam Sơn Sugarcane Joint Stock Corporation is one of eight sugar mills in Việt Nam that has grid-connected CHP biomass fuelled projects. HÀ NỘI – As Vietnamese sugar mills gird themselves for stronger competition in the future, with ASEAN trade agreements calling for lower import duties, they have sought to develop alternative revenue streams. One of these is the production of electricity from bagasse, the pulpy remnants of sugarcane that has been crushed to release its juice. But the Việt Nam Sugarcane and Sugar Association (VSSA) says the price of electricity produced from bagasse at sugar mills is too low, forcing mills to consider abandoning the plans. Phạm Quốc Doanh, Chairman of the Association, urged the Government to raise the price at a seminar yesterday addressing opportunities for energy projects in the Vietnamese sugar industry. The forum was jointly organised by VSSA, the Global Green Growth Institute- GGGI, the Renewable Energy and Energy Efficiency Project of the German international development consulting group GIZ. The current price of bagasse-produced electricity is 5.8cent/kWh (VNĐ1,220), Doanh said. If it does not rise, sugar cane mills will choose to export their extra bagasse or turn it into animal feed instead of using it to generate electricity, he predicted. 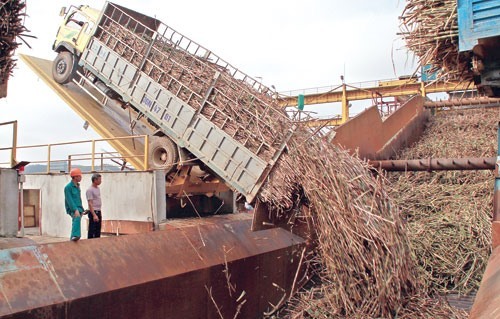 According to the chairman, Việt Nam’s sugar industry projects that 20 million tonnes of sugarcane in 2020 will produce 2.4 million MWh of electricity annually, and 24 million tonnes in 2030 will produce 2.8 million MWh. The participation of the sugar industry in bagasse electricity generation is an important component of the country’s larger goal of increasing its use of biomass fuel, participants at the forum said. Adam Ward, GGGI Country Representative in Việt Nam, said the country’s target of supplying 2 per cent of its electricity through biomass by 2030 requires the involvement of private sector investors. Attending the forum, Government management agencies heard concerns and proposals from representatives of commercial banks and sugar mills. Their comments focused on the need to increase the price of the biomass power because the cost of maintaining necessary machinery is huge. Unless the price rises, they said, mills will see bagasse electricity production as a terrible investment. The VSSA reported that at present, power production projects using bagasse at eight sugar mills in the country have a total generation capacity of 477 Megawatt (MW). As of this year, 99.8 MW are connected to the national grid, contributing to the country’s available power supply. The eight sugar mills are Lam Sơn (Thanh Hóa Province), Nghệ An, KCP Phú Yên, Khánh Hòa, TTC Gia Lai, BHS Ninh Hòa, TTC Tây Ninh and Sóc Trăng. Why Vietnam for the second Donald Trump-Kim Jong Un summit?